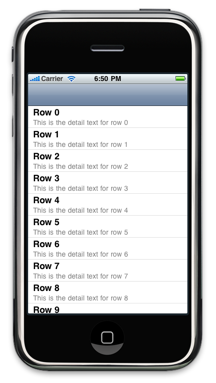 Making table cells with custom backgrounds is a common thing for iPhone developers to want to do, and there is a lot of information around the net about how to do it. Why should you read this tutorial? Well, this tutorial is designed to make it as easy as possible: just copy some files to your project, make a couple of source code changes, and bang! instant gradient backgrounds. With easy stuff like this out of the way, you can concentrate on doing whatever is unique for your application. Also, unlike some older tutorials, this one lets you use the built-in UITableViewCell textLabel and detailTextLabel properties, rather than creating your own custom cell from scratch. So it's easy to retrofit existing code. To give credit where it's due, I got a lot of this information from the article How To Make Ultra-Slick Gradient UITableView Cells at manicadev.com, so go check that site out. What we'll do is create a simple example project, and then show how to add the gradients. In Xcode, choose the File -> New Project… menu item. Choose iPhone OS -> Application in the left pane of the New Project dialog. Save the project as "GradientTableViewCellExample"
Not bad, but it would look more interesting if, instead of the flat white table cells, we had three-dimensional-looking gradient backgrounds on those cells. Add this image to your project, or create your own background image if you're so-inclined. Grab the source files GradientTableViewCell.h and GradientTableViewCell.m, and add them to your project. 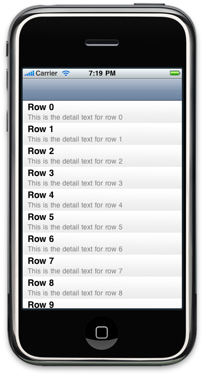 GradientTableViewCell overrides two methods of UITableViewCell. First, we override the initWithStyle:reuseIdentifier: method so that it adds the gradient background image, stretching it to fill the cell. Now, we just have to change our RootViewController.m file so that it will use GradientTableViewCell instead of a plain old UITableViewCell. Note that the gradient image I provide is pretty subtle, so the effect may not show up well in your web browser. Look at in on an actual iPhone, and experiment with different background images to get the effect you want.